Hong Kong, 1992 Colour, B/W – 154 min. Ruan Lingyu (Cheung) was one of the most famous Chinese actresses in the thirties, the time when Shanghai was labelled “The Paris of Asia” and the film industry flourished despite the conflict with Japan and the political frailty of Chiang Kai-shek's republic. Ruan rose to fame after joining the Lianhua Studio, playing modern women struggling against the traditional and patriarchal society of the time. Frustrated love relationships and her private life under the scope and censorship of the press would eventually lead her to suicide before she was 25. The film recovered her memory six decades later. 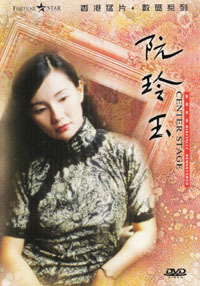 Although it remains one of the most famous works by Kwan Kam-pang, Center Stage was unavailable in its full cut for years. Responsibility underlies in a Laser Disc edition for which the film was re-mastered into a more convenient duration, being the short edition used afterwards mainly due to the laziness and neglect of the right's owner. Now available on the Fortune Star's catalogue, released by IVL in Hong Kong, Ruan Lingyu may be seen for the first time in its longest version, even going beyond the original editing shown at the Berlin Film Festival where Maggie Cheung Man-yuk received the Best Actress Award. Center Stage, such as Rouge, is a Jackie Chan's Golden Way production. 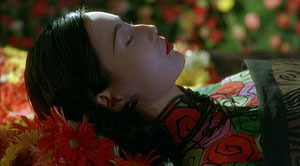 Rouge starred Anita Mui Yim-fong (prematurely deceased in 2003), the director's first choice to play Ruan. 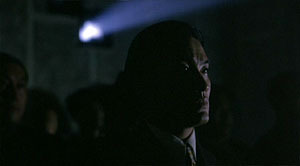 Mui would invoke personal reasons to refuse the part, making way for Maggie Cheung's international acclaim. Ruan became a star due to films like The Goddess/Shennü,(1934) (on set, on the right). .
Kwan's film is a non-typical biopic. The recreation of the Shanghai actress's life cohabits with regular interferences of reality: interviews with some survivors of the time, such as actress Li Lili (played by Lau ka-ling in the film), interviews with writer Shen Chi, author of a biography about Ruan, conversations with the cast about their characters and clips of some of her films that weren't lost forever. The director's choice — he considered up to a certain point editing the film as a conventional biography, neglecting the interviews — is interesting, considering that the life of the actress resembles a melodrama without any need for “dramatization”. Ruan with Zhang Damin (on the left) and with director Cai Chushen (Leung Ka-fai), before a studio set. When Ruan divorces Zhang Damin (Lawrence Ng), she must endure a long and painful law suit eventually accepting to pay an alimony so that he would leave her alone (the money is directed towards gambling). When she goes to live with wealthy businessman Tang Jishan (Chin Han), her life does not improve much: he is married, has another mistress and is very jealous, having frequent fits of rage. The film New Women/Xin Nuxing (1934), directed by Cai, enrages the media: inspired by the life of actress and writer Ai Xia, it strongly condemns the actions of the press that may have contributed to lead her to suicide – a situation very similar to Ruan's own life. In order to obtain more dramatic intensity, the director superimposes the sentence “I want to live!” on the picture, rather than using the conventional inter-titles. It is hard to believe that after her death the press' strain and the social reproach would manage to overcome the love and care from her public: her funeral procession stretched for more than two miles and, according to reports, several fans committed suicide. The New York Times placed Ruan on its front page, noting that her funeral procession was longer than that of Rudolfo Valentino, deceased the previous decade. 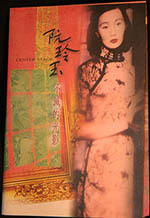 Although Center Stage is a finely balanced film, considering its biographical peculiarities, we can't avoid thinking about the possible outcome had Stanley Kwan been interested in conventional drama, and what other possibilities would have been presented to the cast, especially to Maggie Cheung. Available on DVD through Fortune Star/IVL (HK, R0). It includes sound tracks in Dolby 5.1, dts and 2.0, but this one is also re-mastered with some surround effects (original sound is mono). Extras include trailers (original and new), picture gallery and two interviews: one with the director (12') and another with Paul Fonoroff (13'), author of the book “At the Hong Kong Movies” and identified in the piece as a “famous film critic”. Compression is not perfect on the darker scenes but, in general, it is a rather acceptable transfer, especially considering the price.